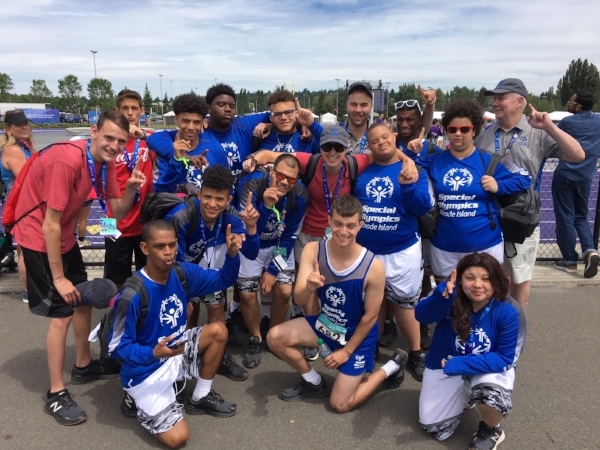 Special Olympics athlete Antonio Piccirillo from Rhode Island is a multi-talented athlete who plays baseball and soccer, and runs track and field. He enjoys each sport for different reasons, but his true passion is flying high in the long jump. “The long jump makes you test yourself and compete against yourself every time,” says Antonio. The 21-year-old athlete is intensely focused and dedicated according to his coach, training three times a week on the track, as well as running by himself in the park near his home two times per week. He is constantly striving to performs at his best. During the long jump competition, Antonio had support from a huge fan club – the Rhode Island basketball team, who wildly chanted his name every time he stepped to the line. During the 2018 USA Games, Antonio also competed in the 200m, 400m and 4 x 400 relay.